When it comes to defending our children, there are the states that should, the states that can, and the states that do. I’ve posted a similar map before. I suspect I’ll have to update it again. The map keeps changing, and fortunately the change is for the better. In this case, change doesn’t come easily. 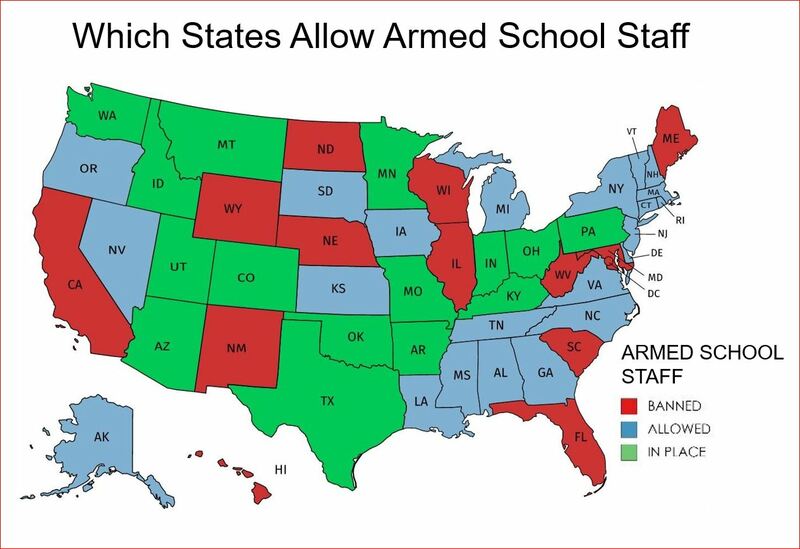 Some states have to work around existing laws to put trained and armed staff in place to protect our children. For example, state law might say that only law enforcement officers or hired security guards may be armed on campus. That may require the local sheriff to designate school staff as reserve, auxiliary, or special deputies. They may have to get a security guard license. That solution wouldn’t let the usual mall-cop carry at school, but it allows designated and trained school staff to carry concealed on campus. Other states have insurance and regulatory issues for armed staff. Those are the work-arounds we use until our laws catch up with our needs. Any minute now would be soon enough. In this recent map, Arizona and Pennsylvania changed status. Arizona allowed school staff to be armed, but it now has programs in place. Pennsylvania forbids school staff from being armed, but some sheriffs worked around the law and deputizes selected school staff. Some counties and school districts in Florida announced a similar work-around program. I’ll wait for the program to be implemented before I change Florida from red to green. Please let me know as you notice programs in your area. Hat tip to Laura Carno for this tip. The law in Wyoming changed last year, and a Wyoming school board authorized armed staff. Again, I’ll wait until they put the program in place.